This article is presented by Mark Bourguignon, the founder of Ascend Wealth Management, a private wealth management and financial planning firm located in the San Francisco Bay Area. Mark is an advisor on the Wealthramp platform, has signed a fiduciary oath and is a strong advocate for financial literacy and education. Individual retirement accounts (IRAs) are powerful tax-advantaged savings accounts that many investors are either not taking advantage of at all, or not in the correct manner. Often, this is due to a misunderstanding about how IRAs work. I sometimes hear, “I didn’t know I could contribute to an IRA, if I have a 401(k) plan at work,” or “My income level prohibits making contributions to an IRA.” Other times, investors are just unsure what type of IRA—Traditional or Roth—they should utilize. This article will explain the basic similarities, differences and benefits of traditional IRAs and Roth IRAs and discuss a unique strategy, the “Backdoor Roth IRA,” that can help you contribute to a tax-free Roth IRA, even if you are a high-income earner that is typically prohibited from accessing them. What’s the Difference Between a Traditional IRA and Roth IRA? Both traditional and Roth IRAs have the same annual contribution limits ($5,500 in 2018), catch-up contribution allowance ($1,000 beginning at age 50) and qualified (non-penalty) withdrawal age, beginning at 59 ½. While there is no income threshold for making traditional IRA contributions, there is an income level at which the contributions are no longer tax deductible. If full- or part-time work is an option that you require and/or prefer, only a Roth IRA will be available after age 70 ½. With a traditional IRA, RMDs are unavoidable and may impact your tax rate on other sources of income. Failure to take proper RMDs results in one of the most onerous penalties in our tax code: 50%! Your current tax rate vs. expected future tax rate will determine the value of an up-front deduction. Since you will eventually owe taxes on all the investment growth (in addition to the contributions) in a Traditional IRA, the growth is only tax-deferred, not tax-free. Again, your current tax rate vs. expected future tax rate will determine the value of an up-front deduction vs. tax-free growth and distributions. Roth IRAs are a valuable estate planning tool that can avoid “double taxation” and maximize your legacy. So Which Type of IRA Is Right for You? As with most things related to your wealth, the answer depends on your unique situation and outlook for the future. A good guideline, however, is that if you are planning on early retirement and/or feel that your future tax rates will be lower than they are currently, a traditional IRA makes good sense. No Required Minimum Distributions (RMDs). Roth IRA owners have no requirement to take distributions at a certain time, while traditional IRA owners must take RMDs according to a defined schedule beginning at age 70 ½, regardless of their need. These RMDs are taxed as ordinary income and may affect the taxation of any additional retirement income, including: social security, investment income/capital gains, part-time work, pension, rental property, etc. Investment Flexibility. Strategically allocating your investments to multiple “tax pools” (e.g., taxable, tax deferred, tax free) provides an opportunity to lower your income taxes and estate taxes, reduce trading costs, and even increase returns. Distribution Flexibility. Having multiple account types to withdraw from during retirement creates flexibility, enabling you to use strategies that may avoid unnecessary taxes. Estate Planning. No RMDs and the tax-free inheritance of a Roth IRA make it a better tool for leaving money to others. If you’re now thinking that a Roth IRA is more desirable, you’re not alone. In 2010, the IRS removed the income limit on your ability to move money from a traditional IRA to a Roth IRA (known as a Roth conversion) and for the first time ever, conversions exceeded total combined contributions to both types of IRAs. In fact, the number of conversions increased over 800% in 2010 to $64.8 billion, and most of those conversions were done by high-income earners — the same cohort that IRS rules explicitly prohibit from making direct Roth IRA contributions each year. While the income limits on conversions were removed, the income limits on contributions to a Roth IRA stood pat (>$135,000 if you’re single; >$199,000 if you’re married filing jointly). Thus, high-income earners were able to pay the associated taxes and convert unlimited amounts of money into a Roth IRA, but they still couldn’t make annual Roth IRA contributions. As well, the ability to make tax deductible contributions to a traditional IRA is phased-out above a certain income level ($73,000 for individuals and $121,000 for married couples). This meant that many investors were denied any chance to receive the tax deduction benefits of a traditional IRA and the tax-free Roth IRA was not available at all. This left many high-income earners feeling left out. When you come home and find that the front door is closed, you normally check the back door. When it comes to Roth IRAs, a perhaps unintended, but perfectly legal, consequence of the 2010 IRS rule that removed income limits on Roth conversions, also unlocked the possibility of funding a Roth IRA every year via a Backdoor Roth IRA. 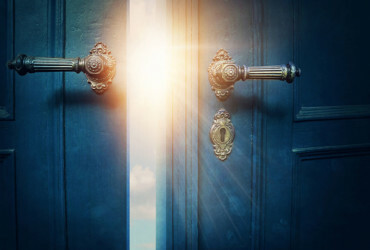 The Backdoor Roth IRA is a two-step process that provides a way for high-income earners to make annual Roth IRA contributions. This strategy is viable for two reasons: 1) anyone, regardless of income, can make a non-deductible contribution to a traditional IRA, and 2) there are no income limits on Roth conversions. Make a current year non-deductible contribution to a traditional IRA. Conduct a tax-free Roth conversion of the contributed amount at a later date. There are some important details you need to be aware of, when executing a Backdoor Roth IRA. The first is the IRS “pro-rata rule”, which is the formula used to determine how much of a distribution is taxable when you, as the account owner, hold both after-tax and pre-tax dollars in your IRA(s). The second is IRS Form 8606, a simple form that keeps track of the “basis” (i.e., non-deductible contributions) in your traditional IRA, so that you don’t pay taxes again on those dollars when they are converted into a Roth IRA. What’s the Value of a Backdoor Roth IRA? “Is this really worth it?” you ask. I find that the best way to evaluate financial strategies and present options to clients is to show a year-by-year progression, using tables and charts. It’s worth pointing out that the Backdoor Roth IRA strategy is for high-income earners who are traditionally “locked out” of making any tax-deductible contributions to a traditional IRA or any sort of direct Roth IRA contribution. The alternative is to put funds into a taxable/trust account each year. Without crunching any numbers, it’s a no-brainer to say that shifting money from a taxable account to a tax-free account is, of course, always highly advantageous. Using conservative assumptions, we can show that utilizing the Backdoor Roth IRA strategy for 30 years increases the after-tax buying power of these investments by 49%! This assumes that all of your investments are liquidated at age 65, and only long-term capital gains taxes are paid from the taxable account. If you assume that state taxes are owed as well (they are owed in 41 states), that any of the gains during those 30 years are taxed as short-term, or if any of the money is liquidated at a later date, your buying power advantage would continue to increase. If you find yourself intrigued by the benefits of a Backdoor Roth IRA, you’ll be excited to know that there’s another strategy, referred to as the “mega Backdoor Roth IRA,” that may allow you to contribute an additional $36,500 per year to your Roth IRA regardless of your income level. That’s more than 6 times the annual $5,500 contribution limit. This is a feature available in some company 401(k) Plans that, if available, offers the potential for you to drastically increase the size of your tax-free retirement nest egg. Developing an intelligent investment strategy is only the tip of the iceberg, if you want to maximize your wealth. A comprehensive financial plan should also consider other actions, such as reducing taxes as a way of generating alpha (outperformance) from your portfolio. After all, what you don’t pay in taxes each year is available to reinvest, and compound, over many years. 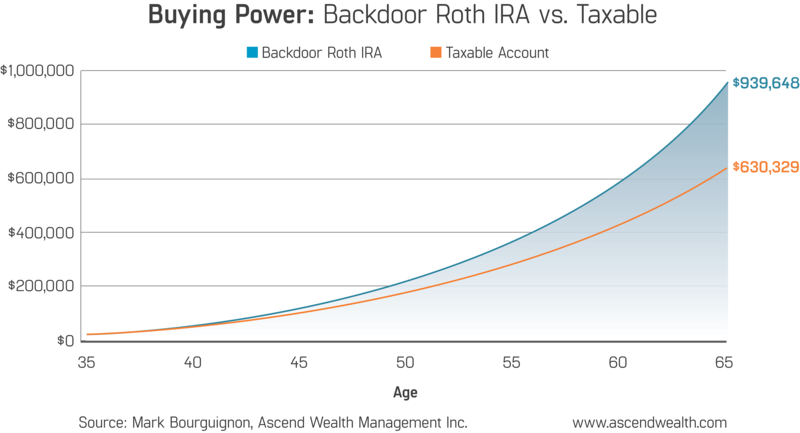 A Backdoor Roth IRA is just one of many viable tools for reducing taxes and increasing your risk-free alpha. In addition, we find that utilizing all types of tax-advantaged accounts available to you (e.g., IRAs, 401(k)s, HSAs, 529s, etc. ), knowing the optimal order in which to contribute to them, and taking distributions in a tax-effective manner, all serve to greatly enhance your wealth. If you find the choices regarding your investments to be overwhelming, or don’t have the time to navigate the landscape on your own, it’s a good idea to find a reputable investment advisor to help you. We find that many of our clients are plenty smart, but they’re also very busy and have other ways they would prefer to spend their time. They feel relieved to utilize the experience of a professional who deals with the same opportunities often.